How to See the Custom Komi Setting? On the open games list, I noticed that sometimes a little red warning sign appears next to some games, where if you hover over that it says “Custom Komi Setting”. Is it possible to somehow see what that custom komi setting is? At the moment, as far as I know, the only thing you can do is click accept and see it in the acceptance-check dialog. Some people are continuing to find it amusing to set up silly komi games, so this is actively under review at the moment. 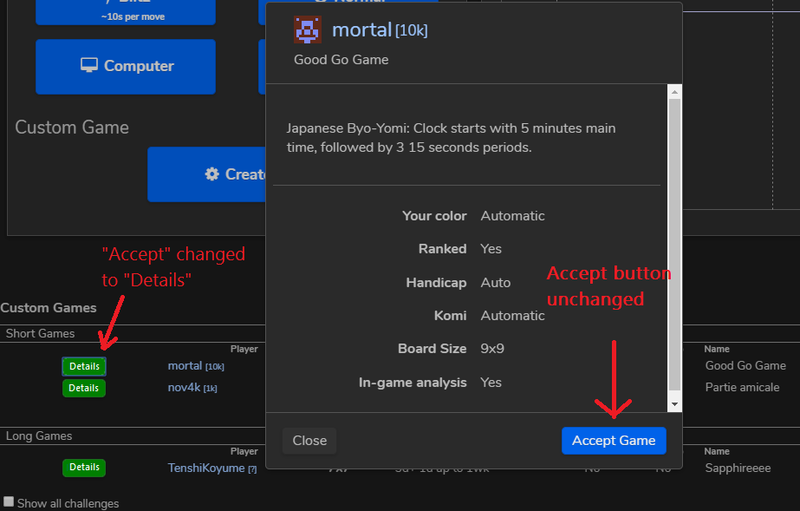 Just to make it completely clear - clicking accept the first time does not actually accept the game - it just opens the match details and you can still back out if there is something there you do not like. Why not change ‘Accept’ to ‘Details’? I don’t know. It is sort of a compromise I guess. If it was “details” I can imagine people would be asking how to accept… And having two buttons seems unnecessary to me? Or maybe I am just lazy to look for solutions but anything is of course up to discusssion - and it would be an easy change (I imagine) if more people think it might help significantly. Unfortunately I must reluctantly agree that some people might be left wondering how to accept. Apologies to yebellz for the slight hijacking. Is it possible to somehow see what that custom komi setting is? To see the details, you must click on the “Details” “Accept” button. I think it's more likely that someone would be reluctant to click on "accept," believing that means "start the game," than that someone, unsure about how to accept, wouldn't at least try to click on "details," the only available button, before calling it quits and asking for help.